The Knot, a website dedicated to wedding planning, states that the month of December is when more people get engaged than any other time of year. So, if you’re thinking about doing a special proposal in the coming holidays, it’s a great time to start shopping for an engagement ring and diamond. Of course you also need to be getting ready, no matter what time of year you plan on proposing. 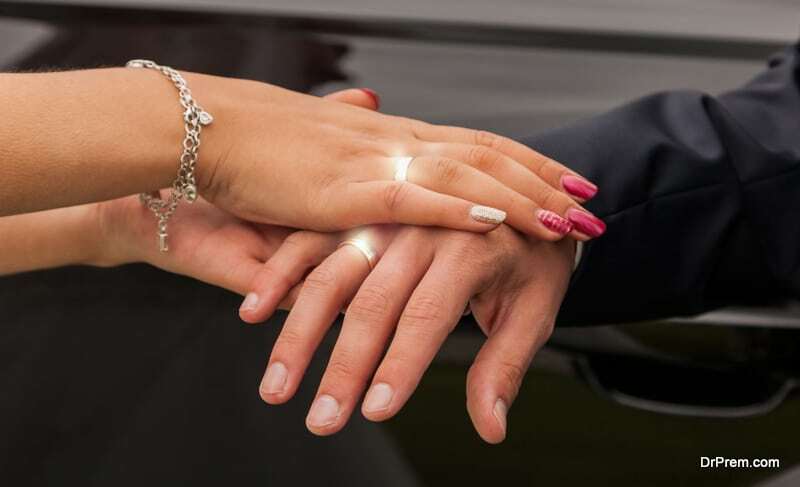 If you’d like a few ideas to celebrate this romantic moment of your life without going bankrupt along the way, then keep reading to learn a few things. The first thing you should do is something you shouldn’t do, which is following the old rule relating to three months of salary. Don’t worry yourself for one minute about what anyone else would spend on an engagement ring. There are actually multiple salary-based rules of thumb you’ll hear about, but most of them, if not all, can be traced back to the diamond industry and their clever marketers. Only spend a reasonable amount that reflects your lifestyle, income, and budget, not what anyone else thinks. The value of an engagement ring doesn’t actually correspond to the value of a relationship anyway. Hugo Mialon and Andrew Francis are economics professors at Emory University, and they surveyed thousands of married couples across America. Interestingly, they discovered that the more someone spent on their engagement ring, the shorter was the actual marriage! Diamond rings are usually priced based on flaws one could find in them, as diamonds with more blemishes are cheaper. However, not every identified flaw in a diamond can be seen by the naked eye. If you’re new to buying diamonds, then you might not even notice the differences between flawed diamonds and supposedly perfect ones, at least without scrutinizing them under magnifying glass. Even though your shopping might start with brick and mortar jewelers, don’t stop there. Take the show to the road, specifically by going online. 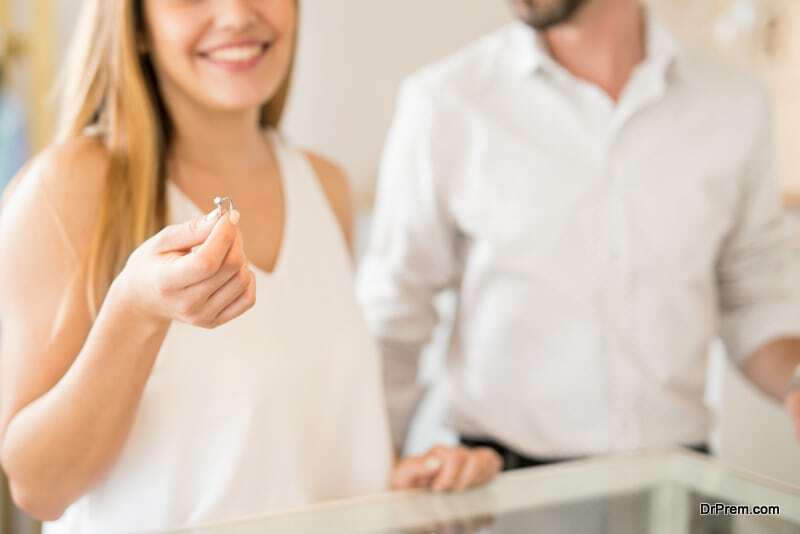 There, you’ll have the opportunity to pick from a broad selection where you can learn about the various kinds of diamonds and compare their prices at a comfortable pace without a salesperson breathing down your neck. On top of that, select diamond stores online will only collect sales taxes on the orders that get shipped to particular states. For example, at the time of writing, Blue Nile only charged sales tax on orders getting shipped to the states of New York and Washington. Mind you, this doesn’t mean you are free from paying sales tax, as you might be personally responsible for reporting such taxes on your own. If the person you hope to be your bride isn’t all that conventional or traditional, consider skipping the count of diamonds in the engagement ring. Another precious gemstone, such as an emerald or ruby might substitute nicely in the engagement ring. Such stones prove less expensive when compared to diamonds and might still prove stunning jewelry to signify your engagement. Also be willing to consider a gold band rather than platinum. Platinum is of course prestigious and durable, but white gold, rose gold, and yellow gold are still great choices that save you money and look great. If you want something unique, go for something customized instead of branded. As you shop, branded rings with branded designs will certainly catch your eye, but the price tags attached to them are likely to catch your attention even more. Try to have a collection of photos of things you like so you can have a custom-made ring done by a jeweler for a lower total cost. A lot of jewelers are happy and even enthusiastic about the chance to create something customized in design based on ideas and photos you provide. Shop around jewelers for quotes, and make sure you communicate clearly using multiple photos the idea of what you have in mind. If your future partner knows you are going to propose, talk to them about what they’d like in their engagement ring from Elizabeth Diamond Company. Such conversations can take the fun out of the process a bit, but an engagement ring is something that is a lifetime purchase. In some families, they even get passed down through the generations. Sacrificing some spontaneity now to establish just what you actually want versus what you’re able to afford is sometimes well worth it. Research and communication can prove a great starting point for a sound marriage, and the right ring at the right price could just be the greatest wedding present you ever give one another. Your job isn’t done once you pick a ring. Learn about return and exchange procedures and policies. Keep in mind that customized or engraved jewelry often can’t be returned. These return policies might also influence your proposal date too. You don’t want to waste money on a ring you can’t return if your partner hates it or says no. Of course if they say yes, it’s a good idea to get that ring insured. Consult your insurance provider about whether or not your current coverage will protect it or if you need additional coverage added to your policy. Some jewelers, but not all, offer warranties on their purchases, so be sure to ask and then learn the terms if they do. Some might require rings to be brought in for six-month inspections, otherwise the warranty might become void.